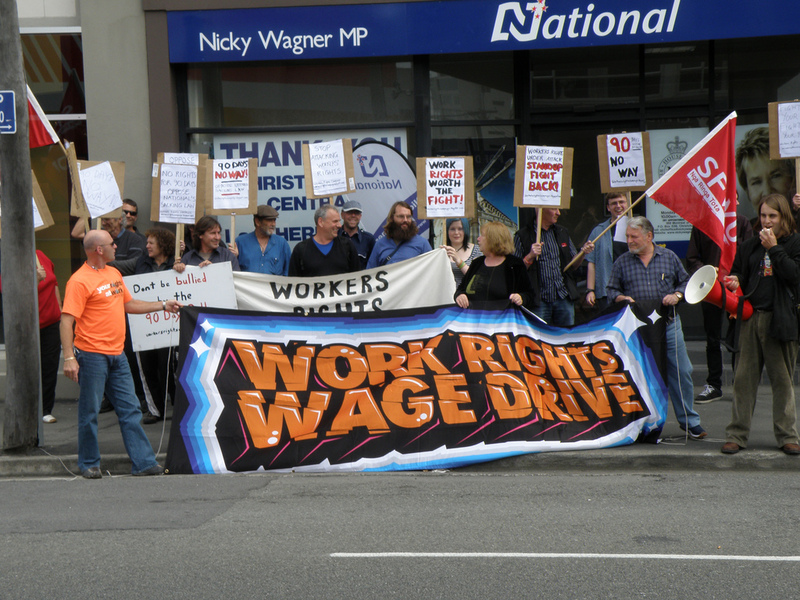 Around 30 people picketed outside National MP Nicky Wagner’s office on Friday 27 February in protest at the government’s 90 day sacking law. The picket was called by the Workers Rights Campaign, a joint WP-Alliance initiative which has broadened out to involve class-struggle anarchists, Socialist Workers and anyone who wants to oppose the 90-day legislation on an anti-capitalist basis. Wagner’s staff locked the doors, apparently fearing an occupation although one hadn’t been planned. Occupations can wait until the first firings start. The attendance included Workers Party, Alliance, Socialist Workers, anarchists (including from the new Workers Solidarity Movement), and small contingents from both the EPMU and SFWU, with their union banners, plus some high school students from Unlimited (an alternative school in the city centre).